This article is a short summary of Golden Sun (game). Golden Sun Universe features a more in-depth article. Golden Sun is a turn-based role-playing game, developed by Camelot Software Planning and released for Game Boy Advance in 2001. 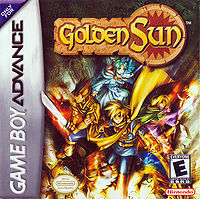 As the first title in the Golden Sun series, the game was later followed up on by two sequels: Golden Sun: The Lost Age, released for Game Boy Advance in 2002/2003; and Golden Sun: Dark Dawn, released in 2010 for Nintendo DS. In a dark time, an epic adventure begins as evil slowly envelops the world! The forces of darkness are pursuing the lost art of Alchemy, and as they draw ever closer to their foul purpose, mankind's future hangs in the balance. You and your companions are the last hope: armed with noble weapons, mysterious Psynergy, and a host of elemental creatures, you must find a way to stem the evil tide. Your ordinary life is over, as a Golden SUn rises above you and forever broadens your horizon! Unbelievable magic! Gather the four types of elemental creatures–fire, water, wind, and earth–and combine them in different ways for some of the most awe-inspiring magical spells ever seen. Go head-to-head with a friend! Link up with a Game Boy® Advance Game Link® cable (sold separately) and square off your parties in a no-holds-barred battle! Weyard was a prosperous world in which Psynergy was used to advance civilization. Psynergy comes from the 4 elements that make the cornerstones of the world: earth, fire, water and wind. Those who could wield psynergy were called Adepts, and for centuries they lived in peace and harmony. However, little by little humans started to abuse their powers and the ancients saw the necessity of sealing the powers of Psynergy to stop the imminent wars and destruction. Four lighthouses were erected in different continents of Weyard, each one to seal one of the powers of nature and the keys to ignite them again, the Elemental Stars, were hidden deep withing Sol Sanctum. For centuries the study of Psynergy became limited to a few. 3 years after a disastrous night that took the lives of Isaac's father and Jenna's parents and older brother, the peaceful community of Vale, at the skirts of Mount Aleph, seems disturbed. Isaac, Jenna, Garet and the scholar Kraden enter the Sol Sanctum to investigate and stumble upon the Elemental Stars. That's the moment in which another group of Adepts appear and take the Elemental Stars, and Jenna and Kraden with them. Isaac and Garet are left inside the volcano but are saved by The Wise One, the protector of the Elemental Stars that warns them that if the lighthouses are lit again disaster will fall upon Weyard, and it is their duty to stop it. This page was last edited on 14 December 2017, at 23:08.